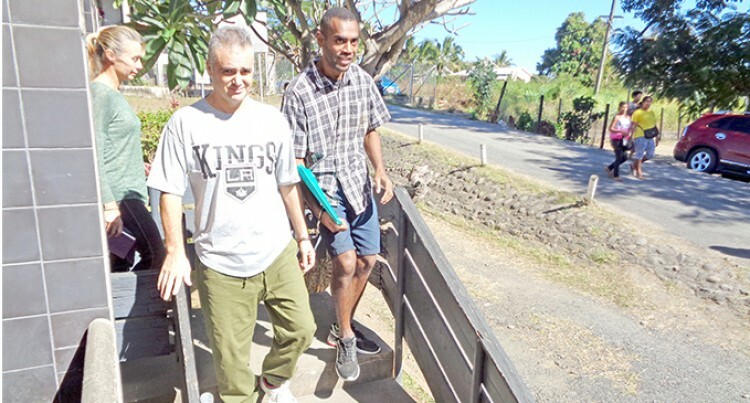 John Nikolic (front-right) with Yvette Nikolic (back) outside the High Court in Lautoka on August 7, 2018. The High Court in Lautoka will later this month hear the plea of the Australian couple allegedly involved in the importation of $40 million worth of illicit drugs along with undeclared firearms and ammunition. While appearing before Justice Aruna Aluthge yesterday, State lawyer Shirlene Kiran wanted to file for the consolidation of the charges orally. Defence Lawyer Wasu Pillay objected to the oral application, saying he himself could not file oral applications in court, even for bail. John and Yvette Nikolic who are currently charged separately on three counts – one count of Importation of Illicit Drugs, one count of Unlawful Possession of Illicit Drugs and one count of Failure to declare arms and ammunition to a customs officer. Both their remand period has been extended. The matter has been adjourned to August 21.